Lovango, originally uploaded by captainjay. Out for a sail today on Far Cry. It's a beautiful day. Don't really have a destination in mind, just knocking around and seeing where the wind takes us. Brought food and drinks so we may not even go anywhere, which would be just as fun. Tacked by Lovango (a little island between St. Thomas and St. John) and thought I'd share The Love Shack. 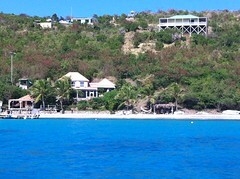 It's a rental villa that comes with the use of a boat if you want to go to St. John. Check out their web site if you get a chance.